First of all, I'm going to be honest and say I feel terrible! I haven't blogged in ages (2 weeks to be exact). Last month, I posted a lot more... I had so many things to write especially with so many, many things happening but I really just did not have the time to sit down, open my laptop, log into my blogger account and just write. So here I am sharing this quick (turned out to be super long) post to update on what has been happening. As you all might have known, before Raya it's just been a crazy hectic period. It begun even before Ramadhan. I was really shorthanded for aere due to some unfortunate events so I had to juggle multiple roles at the same time and felt like sometimes I was splitting myself up into 3 different persons. At the same time there were a lot of good and amazing opportunities that I couldn't refuse so I went ahead with it even when I was really shorthanded. It was a lot of sleepless nights, working throughout the weekends and basically neglecting family, friends and even neglecting my own health during that period because I just had to. At one point I even felt like I had an extreme case of a burn-out. I was constantly on the phone or in front of the laptop or was just at work and didn't have time for the ones I love what more to socialise. It was so bad that a few of closed ones around me alerted me that I was under so much stress. A friend suggested for me to just take 1 day on a weekend off and just spend it with Khubayb without any interruptions for a while. It's actually a good reminder, without which I would have continued just focusing on work and not think about everything else. Sometimes, we just need that reminder to make sure that we take care of our own health as well as to maintain healthy relationships with the ones we love and who really matters. 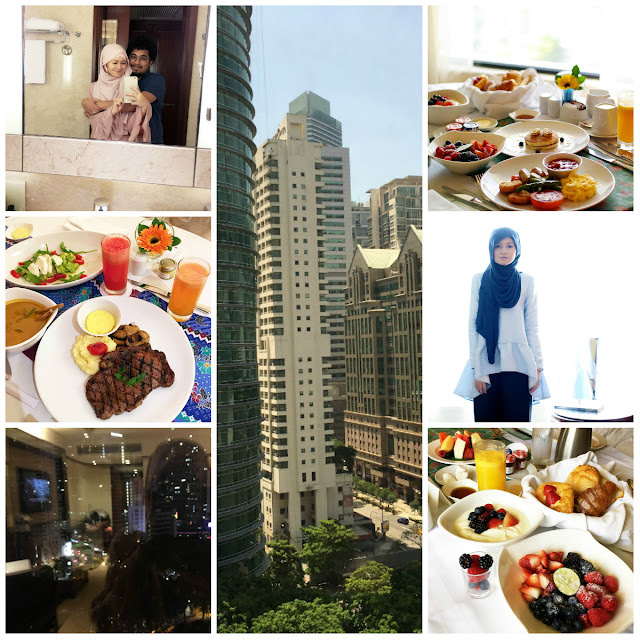 On the last weekend before Ramadhan, it sinked in and I felt I needed a staycation otherwise I would have crashed and burned since there were moments that I felt like it, but the staycation helped me a lot. Basically just spending some quality time with the husband. Alhamdulillah. You really don't need to go far to get away from it all. Just somewhere quiet, somewhere secluded, somewhere no one knows. That's enough just to clear your thoughts and relax your mind, body and soul. So even though I love going on holidays, a staycation was just what the doctor ordered and it really did wonders. Here's me spending some time with Khubayb at the staycation. Only when we reflect can we get the chance to see the light. Ramadhan is a beautiful month of reflection so hopefully we will have the chance to reflect on ourselves, our weaknesses, flaws and imperfections and hopefully transform ourselves to be better than yesterday. It's also a month of forgiveness. So as we enter Ramadhan, I seek forgiveness from each one of you if I've ever hurt and offended you in any way including any of my writings. Forgive me for any wrongdoings. May God guide us and bring peace to our hearts, may God forgive us all and bring us closer to Him and bless us with His Love. I hope that everyone had a happy Ramadhan and may a beautiful blessed one this year. All blue that day in aere's CELIA Top and CERUS Pants. After that I spent some time with my sisters and my family for my brohter's birthday. Will blog about that next :) InsyaAllah. same goes to me..no matter how busy i am..blogging still dihati..